Come party at Verge tomorrow night! A Tribute To Serge Gainsbourg! $5 Admission, to benefit the 10th Sacramento French Film Festival and the Verge Gallery! 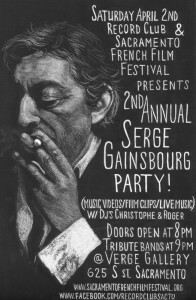 We are hosting a party for Serge Gainsbourg’s Birthday! 2011 marks the 20th anniversary of the passing of French Icon Serge Gainsbourg. Singer-songwriter, director, actor, photographer, provocateur, iconoclast, and much more, Gainsbourg was a major figure in the 1960’s, 1970’s, and 1980’s pop-culture, all through a fog of Gitanes and alcohol… He is still today considered as one of the world’s most influential popular musicians. Come and celebrate the spirit of “Gainsbarre” with us! Doors open at 8pm – tribute bands (Harley White Trio + more!) at 9pm. Raffle Ticket Prizes will be given away courtesy of SFFF!